I was tired of the Adirondacks. 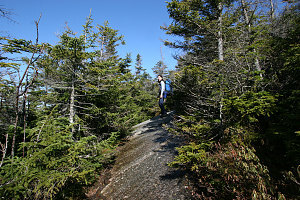 Now, don't get me wrong - I love the Adirondacks. 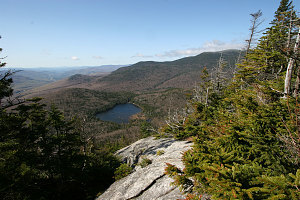 However, I'd spent a lot of time in the Adirondacks recently - and very little time, comparatively, in the mountains further to the east. 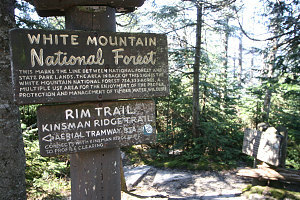 The last time I'd hiked a mountain in New Hampshire was way back in fall of 2004. If I was ever going to get the 111er (or rather, 115er) list done, I had to get moving! 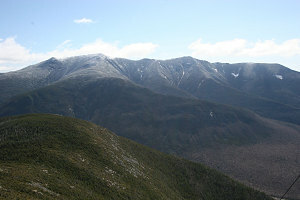 With that in mind, I chose (not surprisingly) a couple of 4000-footers in NH that I'd not yet done, and that were on the "Ottawa-side" of the White Mountains. 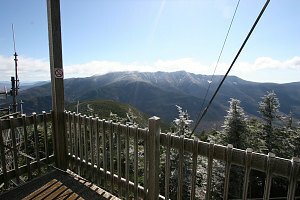 Of the ones I hadn't done, The Kinsmans and Cannon Mountain were good candidates. Given that we were going to be hiking on a Sunday, I didn't want to overdo it and try and bag all three, so I settled on Cannon and North Kinsman. South Kinsman would have to wait for another day - perhaps as a traverse when we had two cars. We drove down on a Saturday night and stayed at a small and inexpensive motel in Eastern Vermont. 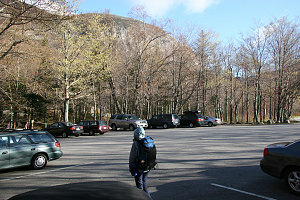 The next day we drove the final 80km or so to the Lafayette Campground in Franconia Notch, where we would start our hike. 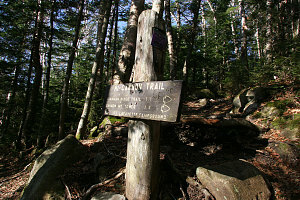 The plan - hike up Cannon Mountain, then along the ridge known as "The Cannonballs", to North Kinsman Mountain, and then back down via a different route to the campground, forming an interesting loop hike. 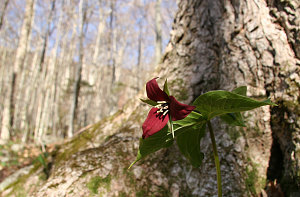 The day was clear and stunning - although much cooler than last weekend's summerlike scorcher in the Adirondacks. 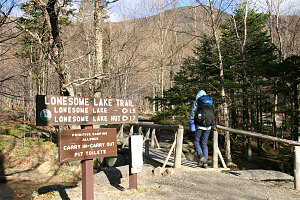 We took the Lonesome Lake trail (which starts right at the parking lot) up through the mostly empty Lafayette campground. 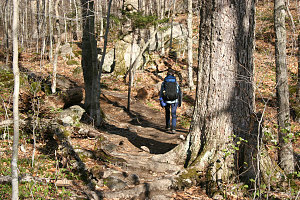 Once through the campground, the trail starts to climb up gently through nice open woodland forest. 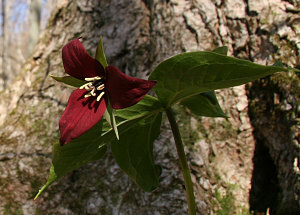 We spotted a particularly nice Purple Trillium flower along the trail (see pictures). 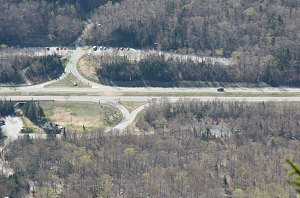 In a short time we reached the turnoff to the Hi-Cannon trail. 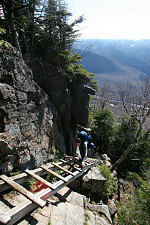 This was our direct route to the summit of Cannon mountain. 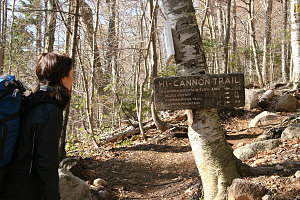 The Hi-Cannon trail climbs up, up, up - very steeply, even with many little switchbacks. 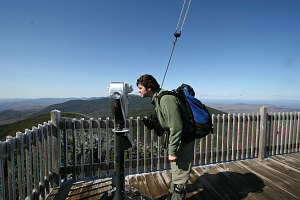 It was not long at all before we were far above Franconia Notch, and could look down and see our parking lot and across to wonderful and rugged Franconia Ridge. No snow or ice to speak of.... yet! 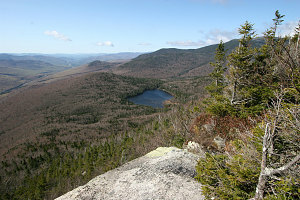 As we topped out of the steep portion we were treated to great views south to Lonesome Lake - our return route. 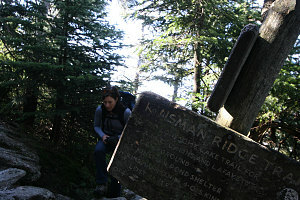 Up at this altitude, at about 3500 feet, what recently had been wet but grippy rock turned to thin sheets of ice. This made progress much slower and more treacherous. 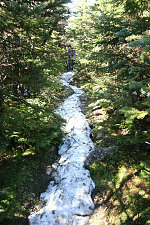 There was also a good amount of old, packed "trail snow": a hard, raised ridge formed from the packing of hikers' feet during the winter. 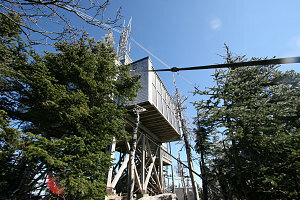 After a bit of horizontal but slippery trail we reached the summit of Cannon Mountain - marked by a large and elaborate communications tower with an observation deck on top. 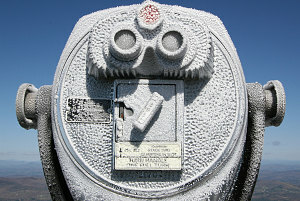 It was surprisingly winterish up here, with cold temperatures below freezing and a very stiff wind. Bits of wind-blasted frost coated everything. 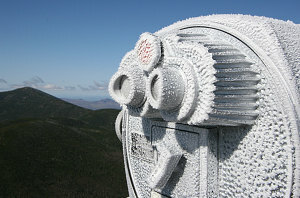 Still, it was crystal clear and the views were great!